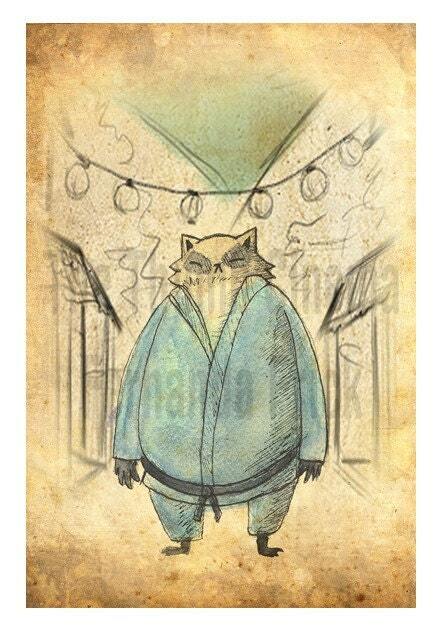 Maybe you people have seen my Judo racoon illustration on my Etsy shop, but who is this character? What's his story? Well, Tanuki-san was born for a College examn, where we were supposed to representate a sport through a short animation. At the very first moment I choosed Judo, because I love martial arts, and really the only interesting sports for me. So we had to do a lot of investigation of the sport to make the short film, along that I decided that my film should had a japanese traditional style. But who or what should be the main character? I really don't like animating humans very much, so I needed an animal. I choosed a racoon because it's a traditional japanese animal and it's the main character of many japanese folk tales, incluiding for they mischievous acts like robbing food. I also think that one of the stereotypes of japan was the typicall Godzilla-like monster that terrorized the town, and I HAD to add something like that xD that's why Tanuki-san is a Giant Judo Racoon hahaha. And the result of all this was this short, it's subbed in spanish but maybe you could understand it anyway. 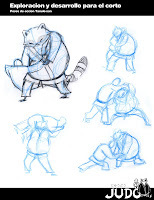 A giant judo raccon terrorizes a small japanese traditional town. He easts and drinks everything that crosses his way, and it's having a great time. The town people are very scared and call the town's protectors, who are a Sumo wrestler, a Karate-kid and a Samurai. 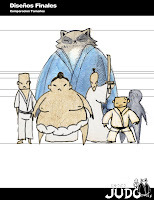 With the power of Judo, tanuki-san defeats them all very easily until a small Judoka like himself challeges him. 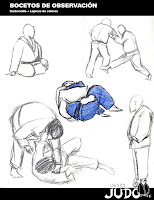 In the end, size or power didn't matter, because the little judoka knew how to use his opponent force in his favor. Tanuki-san leaves town defeated, but not wothout robbing the last montain of food he could! Wow. This is wonderful. 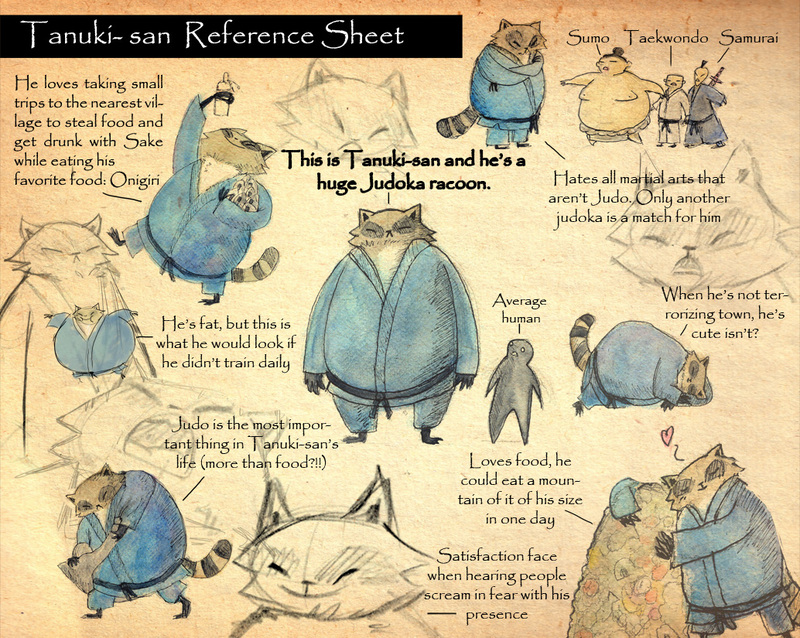 I just happened upon it researching tanuki and am so happy I did! Me encanta! Love your illustrations! Ready through the story behind the characters really brings them to life! Love it!! I'm Fernanda Frick, an animation student from Santiago, Chile. I love animation, music, comics and other geek stuff. Right now, I have my little shop on Etsy that sells flipbooks and illustrations under the name of "The Thumb Cinema"
The Thumb Cinema is Back!